I love the earthy, woody flavor of mushrooms. I don't necessarily like eating big pieces of them, but I love the flavor they bring to dishes. This pasta is something I came up with on my own and it was delicious! Cooking the pasta in the same water the mushrooms cooked in gave it so much flavor. Start to bring a large pot to a boil. Just as it starts to slightly bubble, add the dried mushrooms. Remove them once they are tender, about 3-4 minutes. Chop the mushrooms and set them aside. While the pasta is cooking, heat 1 tbsp olive oil in a large pan. After 1 minute, add the can of chicken broth. Cover and let simmer until the pasta is done. Add the tomatoes a few minutes before adding the pasta. 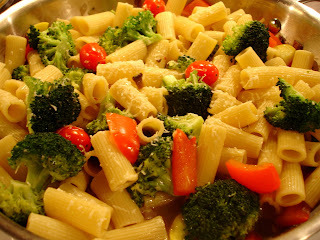 Once the pasta is done, add it to the pan with the veggies. Mix everything together and top with Parmesan cheese. I'm totally going to have to try this recipe. I love pasta, brocolli, shtiake musrooms and tomoatoes. YUM!